Coreopsis (koh-ree-op-siss);Tickseed, Composite Family (Compositae). A genus with many handsome annual and perennials, most of them showy, and all of them easy to grow. They make a brilliant display in the border from early summer to frost, and survive drought and heat. Coreopsis is a garden favorite because of its daisy-like flower, extended bloom season, and long stem flowers. This adaptable and durable relative of the sunflower is easy to grow, pest resistant, drought and soil tolerant. Perennial (and Annual) varieties come in various shades of yellow, dark gold, almost orange, variegated and pink. Coreopsis species heights range from less than 1 foot to almost 4 feet. Most Coreopsis have either cut leaves or fern-like, thread-leaf green foliage, with flowers that rise above the foliage on long, wiry stems. They perform best in full sun, within the flower bed or containers, and make marvelous fresh cut bouquets. 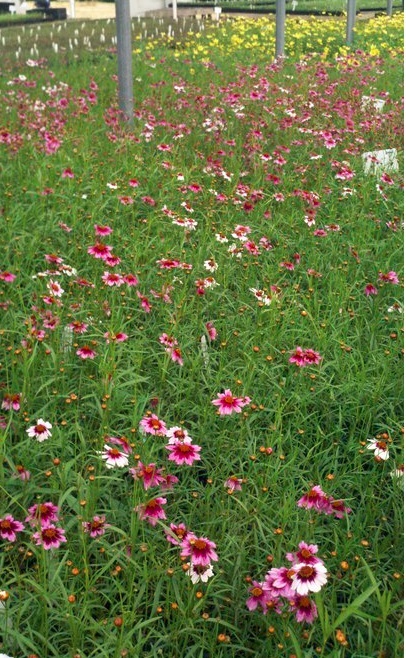 Coreopsis grows in dry to medium moisture, most soil conditions with good drainage, including sandy or rocky. It is tolerant of humidity, heat and drought. Plants may be cut back hard in summer if foliage sprawls or becomes unkempt. Coreopsis is easy to grow, making it a good choice for beginners. One plant will provide you with long-lasting cut flower bouquets all summer long. Plants in the genus Coreopsis are sometimes called tickseed as seeds resemble ticks. Excellent as a border plant, in containers or for cut flowers, in mass plantings, specimen or focal point. When grown in borders or other formal garden areas, division may be needed every 2 to 3 years. Attracts butterflies and Deer resistant. PLANTING: Set plants 6 to 12 inches apart, or more for larger cultivars. Choose a location in full sun or very light shade; Coreopsis is very easy to grow and will tolerate any soil except waterlogged soil. It prefers lean, sandier soils and requires little watering once established. MAINTENANCE: Very little fertilizer is needed, especially once established. Periodically removing spent flowers will lengthen the blooming season. We recommend a mulch of humus or compost. Dividing every 2 or 3 years as necessary will induce stronger growth. Although coreopsis is relatively insect free, aphids, leafhoppers, slugs, spider mites, thrips and whiteflies may be observed feeding on them. Generally disease-free, powdery mildew may occur. Proper plant spacing to allow adequate air movement will reduce the chances of powdery mildew.